“Is resilience the new sustainability?” Jill Fehrenbacher asks in a recent Inhabitat article that has us thinking. Her focus is on steps for making commercial building, particularly in cities on the East and West coasts, more resilient in the face of natural and man-made disasters, such as fire, earthquakes, flooding, and terrorism. If you’ve been reading along with us here at The HOG Blog, you’ll know that we’ve been following with interest Hurricane Sandy in New York City and the resulting new building and design codes in NYC, along with strategies for dealing with flooding from flood walls to built infrastructure. Being in the Bay Area makes us particularly sensitive to earthquake danger, as Sally Dominguez notes in a recent interview with Advance. This Australian non-profit has a global network focused on connecting talented Aussies internationally. In May 2012, Sally was nominated as one of Advance’s 50 for the Future. Resilient design is defined by the Resilient Design Institute as “the intentional design of buildings, landscapes, communities, and regions in response to vulnerabilities to disaster and disruption of normal life”. The HOG tank is built for both sustainability and resiliency. Made with food-grade plastic, it can double as an 50-gallon emergency water supply, as it does at Edna Maguire Elementary School. In the context of schools (or homes) and safety, the tank’s rectangular shape will prevent it from rolling, loaded with 440-pounds of water, over some unlucky soul in the case of an earthquake. This edition, it’s confirmed: HOGs and schools make for an award-winning combination. Congratulations to landscape architect Liz Pulver and Town and Garden! Their design of the Rainlab at The Dalton School was recently recognized with a 2014 Merit Award from ASLA-NY. If you love to delve into the details, you’ll be in HOG heaven over at our new rainwatercasestudies.com site! Preparedness is an element of resiliency too. This February, we’re loading up on resources from estimating your garden’s water needs to easy tips for conserving water to a new website with rainwater case studies. 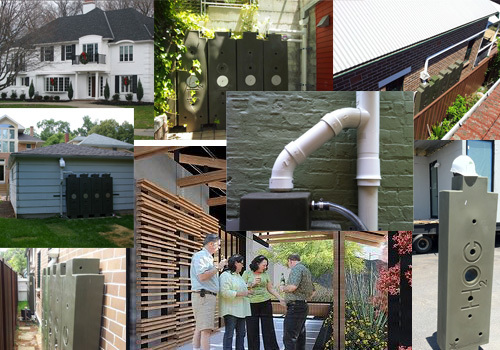 From single tank collection to large-scale harvesting and innovative custom solutions, check out www.rainwatercasestudies.com to find out how to configure your own system. Don’t miss our B.U.G. Design feature on inspirational architect and scientist Ginger Krieg Dosier who’s cutting out the kiln, and the carbon emissions, from bricks by growing bio bricks with her award-winning company BioMason. How much water will your garden need this year? This handy guide from Urban Farmer Store (a Bay Area HOG distributor) breaks down the equation for you. Their sample features a 10×10 veggie garden watered with drip irrigation in zone 1. Click here or on the image below to start calculating! 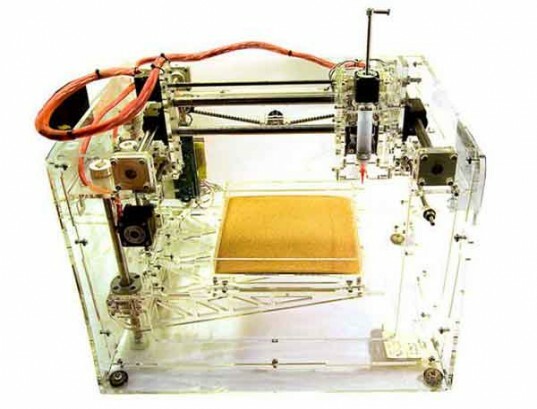 bio bricks from bioMason, Inc.
Ginger Krieg Dosier, former architect and now scientist, is on her way to revolutionizing our aging manufacturing processes with biology, using what she once considered to be the lowest common denominator in construction – the brick. Why is it beautiful? “Ever since I was a child, I have been fascinated with the act of making,” says Krieg Dosier in a TED talk. Many of us don’t think of a brick as a thing of beauty, but what if that brick was grown in a closed-loop system that eliminated all emissions from its manufacturing process? Using sand and bacteria, Dosier’s company bioMason does just that – using a ‘brick nursery’ to grow bio-cement material without carbon emissions. Why is it useful? BioMason’s better, cleaner, and more sustainable bricks have the potential to clean up the building blocks of construction. Flush with the “huge encouragement” of award-winnings (Metropolis Mag’s 2010 Next Generation design competition and Denmark’s Postcard Lottery’s 2013 Green Challenge), Krieg Dosier is at work with teams in the USA and the United Arab Emirates on scaling up the manufacturing process. Why is it green? Bricks are used in 80% of global construction — 1.23 trillion bricks are produced annually worldwide; the firing process releases 800 million tons of carbon pollution each year. That’s more than what is released by all the airplanes in the world every year. Krieg Dosier’s transformative idea uses principles of biomimicry to apply nature to the way we make our physical world. Her planet-saving solution uses chemistry, biology and materials science to grow bricks like one would grow plants in a greenhouse. Welcome to 2014, HOG enthusiasts! But before we go too far, let’s look back at the highlights of 2013. This year more than ever the importance of rainwater harvesting hits home for us. We’re experiencing a historic drought in California that has left our fields dry, our reservoirs low, and our water in short supply. NASA satellite images show a barren landscape, and Governor Jerry Brown has declared a state of emergency. All the more incentive to use HOG tanks – for us, too! 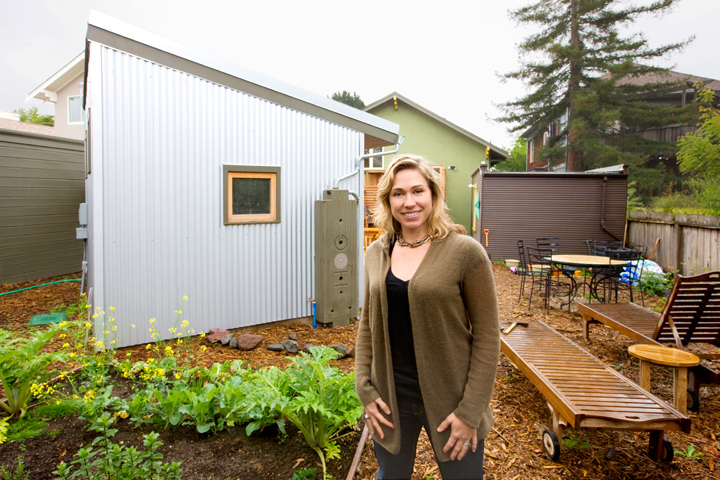 Our marketing manager and HOG writer Mattie Ivy is stepping up to Marin County’s recommended 20% water use reduction. Stay tuned for her video adventures in setting up a HOG system of her own. In the meantime, catch up on a cool catchment system in Maui that transforms air conditioner drip to garden gold. HOG co-founder and designer, Sally Dominguez, is teaching a continuing studies course at Stanford. We pull up a seat in the Insights and Tools for Creative Thinking classroom for our B.U.G. feature.